I am Disney obsessed. No surprise there. However, I didn’t realize how much Disney specific language I used until my family pointed it out to me. 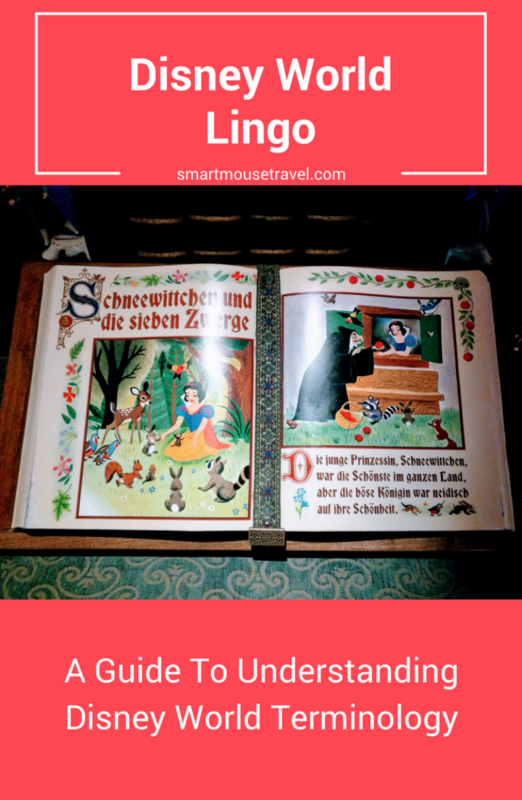 When I talk about Disney World the terms often seem like a foreign language to others. Now that my family mentioned it I notice how much Disney World lingo is used, but rarely defined. To help you better understand some of these Disney World terms I have written a quick reference guide with definitions. Often referred to as ADRs, these are dining reservations made at a Disney property. You may make advanced dining reservations 180 days in advance of a Disney World trip. Want to know more? Trust me you do – read my complete guide to dining reservations at Disney World. This is a meal that includes character interaction as a part of your meal. These character dining experiences allow the convenience of meeting characters while you eat. 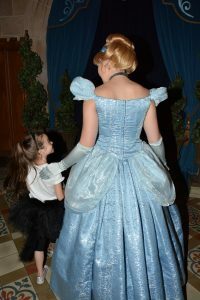 For most of the character dining venues the characters make their way through the dining area and stop at each table to visit with your group. Some examples are Chef Mickey’s and Cinderella’s Royal Table. Check here for a complete list of character dining options at Disney World. This is a free service available to anyone with a ticket to a Disney World park (Magic Kingdom, Epcot, Hollywood Studios or Animal Kingdom). A FastPass+ is basically a “skip the line pass.” If you arrive at an attraction during your scheduled FastPass+ time window (say 10:30am-11:30am) you skip the regular line. You will instead enter at the FastPass+ line and wait a shorter time to experience the attraction. 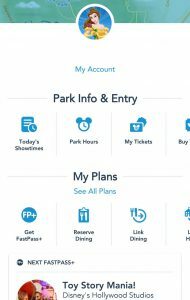 Your FastPass+ reservations can be made using the Disney World website or Disney World app. Find my detailed guide to FastPass+ here. These handy devices are specific to Disney World. 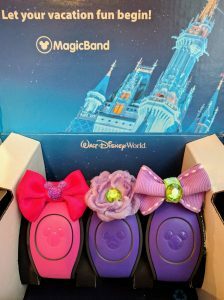 A MagicBand is a bracelet (similar to a watch or fitness tracker) that each person in your party age 3 and older is provided at no additional cost if you are staying on-site at a Disney World Resort. These bands act as a room key, ticket to the parks (once the ticket is linked to band), FastPass+ ticket, and can be used to make purchases across the resort, including using your dining plan credits if you have them. This band is a great convenience and keeps you from fumbling around looking for tickets, room keys and even your FastPasses. We love them, but be careful – it makes it too easy to spend money since you never reach for your wallet! This is a free service provided if you are staying at certain Disney World owned hotels. Magical Express is motorcoach transportation from Orlando International Airport to your Disney World resort. As an added bonus, if you register 30 days or more in advance of your arrival you get special yellow luggage tags. If you place these tags on your checked luggage you can skip baggage claim! Disney cast members will collect your bags and bring them directly to your hotel room within a few hours. If you use the bag service make sure anything you need quickly after arriving is packed in your carry-on luggage. Important note: You must register for the Magical Express prior to your trip by calling Disney World, your travel agent or through the following website. Do not show up to the airport and expect a ride if you haven’t pre-registered. MemoryMaker is a photo package you can purchase that includes all of your digital images taken by a PhotoPass photographer and some taken on rides during your visit. If you purchase this package in advance there is usually a discount. Not sure what PhotoPass is? I define it below. This is an acronym for “Mickey’s Not So Scary Halloween Party“. This party is a separate ticketed event for Halloween that takes place at Magic Kingdom. This event runs from 7pm until midnight on certain nights around Halloween. It is one of the rare times adults may wear costumes at the park. 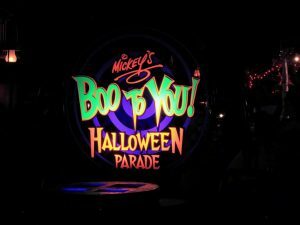 This party has special Halloween themed fireworks, parades, and you have the rare chance to meet some villains. Important note: not all attractions are available on party nights. See if this party is worth the expense here. This is an acronym for “Mickey’s Very Merry Christmas Party”. This party is also a separate ticketed event on certain nights around the Christmas season. 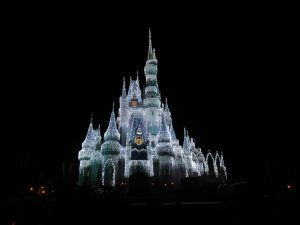 It too takes place at Magic Kingdom and runs from 7 pm until midnight. Only certain rides operate during the party. Mickey’s Very Merry Christmas Party is one of our favorite Disney World Christmas traditions. See what else we love about Christmas at Disney World. My Disney Experience is a Disney World app and also a section on the Disney World website. This app (or website) is your go-to spot to make and view all of your hotel, FastPass+, and dining reservations for your upcoming trip. You can also check current wait times for attractions at the parks, today’s showtimes, and park hours. An add-on option to your basic park ticket for a price. This “park hopper” allows you to visit more than one theme park in a day. If you have a traditional ticket you may only enter one park per day on that ticket. This is much like the add-on option of the “Park Hopper” to your ticket. The difference is this option allows you to move between Disney World theme and water parks on the same day. This service places Disney photographers around the park and with certain character interactions to make sure everyone can be in the picture. The first photographer you have pictures taken by will provide you a plastic card with a code that you can link to your My Disney Experience account. Then each time you have your photo taken by a PhotoPass photographer they scan the same code on the card or your MagicBand. The photos are added to your account by scanning the PhotoPass card or your MagicBand. You may then purchase individual prints/digital images or purchase all of the images from your trip by buying a MemoryMaker package. This is a bag with all of your essentials for your day at the park. 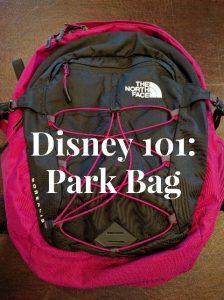 See what 19 things I always pack when we head to the theme park. If certain members of your group are too small or not interested in riding certain attractions Rider Switch may be for you. This service at some attractions at Disney World is most commonly utilized by families with younger children. This way everyone can wait together. When the time comes to ride parent 1 and child go on the ride. 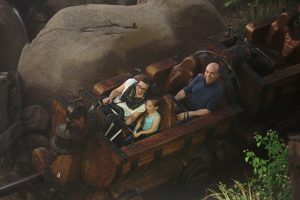 Then when parent 1 and child return parent 2 can ride the attraction with the same child. Find out more about Rider Switch. Did I forget anything? If so, let me know and I can add it to help others! Love this !!! The lingo is prett crazy to newbies!